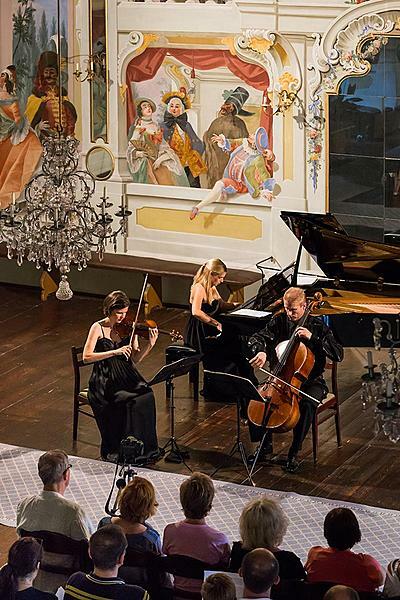 Just like every year, the 33rd edition of the Český Krumlov Festival of Chamber Music will open with the Baroque Night in Český Krumlov Castle®. 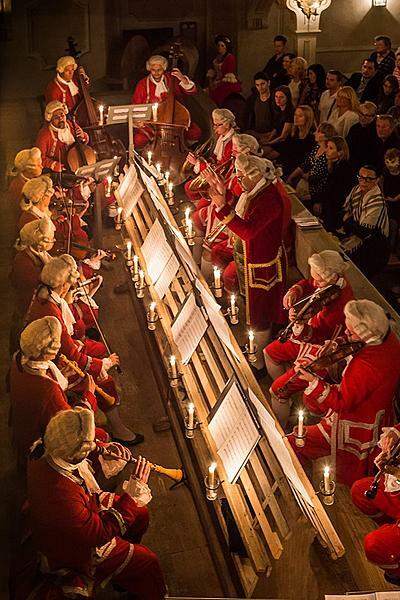 During the exquisite evening of music, dance, song and gastronomy, the visitors will be guided through the castle's exterior and interior, illuminated and arranged in the Baroque fashion. The unique Baroque theatre will host a performance of the comic opera/ballet Les Troqueurs, to Antoine Dauvergne's music and Jean-Joseph Vadé's libretto, which received its world premiere in Paris in 1753. Following its staging in Vienna (1758), a copy of the score was procured by the Schwarzenberg family. The opera will be performed by the Capella Regia ensemble under the guidance of Robert Hugo according to its copy maintained in the Český Krumlov archives. The next concert on the festival programme, titled Compositions for wind harmony from the Schwarzenberg collection, will be given by Harmonia Mozartiana Pragensis. The visitors will have the opportunity to hear arranged melodies from Mozart's and Salieri's operas at the Summerhouse Bellaria in the castle gardens, which has been rarely open to the public. At a free afternoon concert in the Second Castle Court, the Schwarzenberg Guard Jazzband, which enjoyed great popularity in Český Krumlov between the two world wars, will present a repertoire compiled from its music archives. The globally celebrated Czech composer Bohuslav Martinů will be paid tribute to with an evening titled Madrigals, new and old. At a concert marking the 60th anniversary of his death, the vocal ensemble Collegium 419 will perform a selection of Martinů's madrigals along with late-Renaissance secular vocal pieces. Another anniversary to be commemorated within the festival is that of the Czech composer and virtuoso cellist Antonín Kraft, who was born 270 years ago. The cellists Jiří Hošek and Dominika Hošková, and the violinist Miroslav Vilímec will play his music within the Nocturne concert. In this case too, the programme is clearly linked with the Schwarzenberg court - it will consist of works located in the family's music collection. We also have available an actuarial document bearing witness to the fact that in 1795 Kraft, together with the violinist Siegl, gave a concert at the Schwarzenberg Palace in Vienna. All the festival events will feature distinguished artists. The concert in honour of Josef Suk will be performed by the Czech violinist Roman Patočka and the Amadeus triem string quartet, while the Jazz above the Vltava evening will be taken up by the blues band Charlie Slavík Revue & The Rhythm Girls. At the closing gala concert, titled Thanks for 30 years of freedom, dedicated to the round anniversary of the Velvet Revolution in 1989, Ensemble Inégal will perform A. V. Michna's Missa Sancti Wenceslai. The festival will conclude with a concert to be given by two talented musicians, who are currently garnering acclaim, following their successes at prestigious intentional competitions. The saxophonist Štěpánka Šediváková and the accordionist Filip Kratochvíl, making up the Duo akordeON & saxofONA, will perform compositions straddling classical music, jazz and klezmer in the garden of the former Clarissian Convent. Český Krumlov will pay a special tribute to Petr Eben, who this year would have been celebrating his 90th birthday. One of the major Czech 20th-century composers, he spent a large part of his childhood and youth in the city. Symbolically linked with his life is the organ of the St. Vitus Church, an instrument on which he gained his initial experience as a musician and on which, within our festival in 1999, he played during a concert that would be one of the last public appearances he ever gave. Accompanied by Marek Eben as the narrator, at the time Petr Eben performed his cycle The Labyrinth of the World and Paradise of the Heart, which will be revived at this year's organ concert.